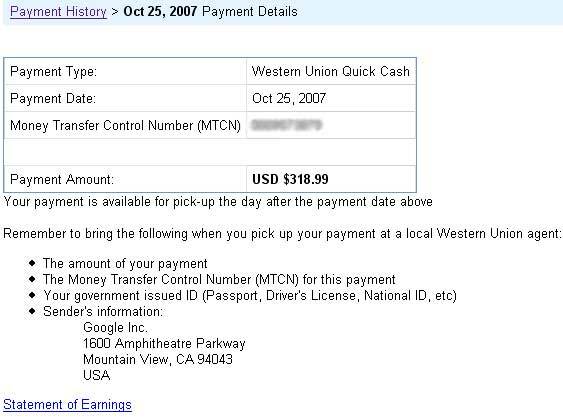 I believe you all know by now that google has implemented a new payment type, Western Union Quick Cash. Now what`s so cool about it? Well as you know the money you earn in September will be sent at the end October. Using a Standard Delivery check you will get you your earnings by the 25th of November and using a Secured Express Delivery check by the 5th of the same month. Now depending on your location you may be close to a CITIBANK center. If you are, you can get your money right away, but if you`re not you will have to get to one or use a local bank. By using a local bank you will have to wait another one or two weeks before you receive your funds and either way you will have to pay a fee.